Town Of Killam, Alberta, Canada, Killam business directory, Town of Killam Directory. 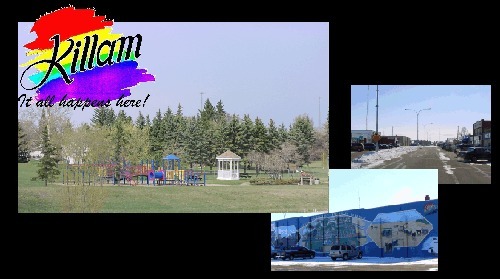 Killam businesses, Killam Alberta website, Alberta Businesses, Town of Killam Alberta. John Deere Agricultural Equipment Dealer, Ag & Turg products, full line of STIJL products. Great Northern Grain Terminal Ltd.
Small carpenter jobs and repairs. Doors, screen doors, trim work, drywall repair, woodwork, furniture repairs, interesting projects and 'custom built dog houses'. Drywall Taping, Mudding & Texturing. Jack M. Byrne Consulting Ltd.
Fax - (780) 385 - 2118 - Please notify prior to sending! Motel accomodation. 2011 Housekeeping Award Reicipent. Clean Quiet and Comfortable. Kitchenette suites avaliable. Eat-in or Take-out, Hamburgers, Pizza, Ice Cream, etc. Budding Ideas Florists Killam ~ Flowers, Home Decor and Giftware. Address - 4719-50 Street, Killam AB. Gift shop featuring the work of local artists, artizans and crafts people. Check out our Facebook Page! Fee and Sons (1978) Ltd. Contact - K2S Enterprise Inc.
Killam Transit Mix (1977) Ltd. Contact - Oakley A. Smith Sr.